In: Proceedings of the 2016 ACM International Conference on Interactive Surfaces and Spaces. ACM, 319-324, 2016. In this work, we discuss important challenges arising when presenting business data in board meetings. After firstly considering the specific characteristic of board meetings, we have identified challenges concerning the following four topics emerging from the multi-display setup of (digital) boardrooms as well as the social situation in those board meetings: Control Presentations (Interaction), Content Presentation (Visualization), Discussion with Audience (Communication), and Remote Presence. 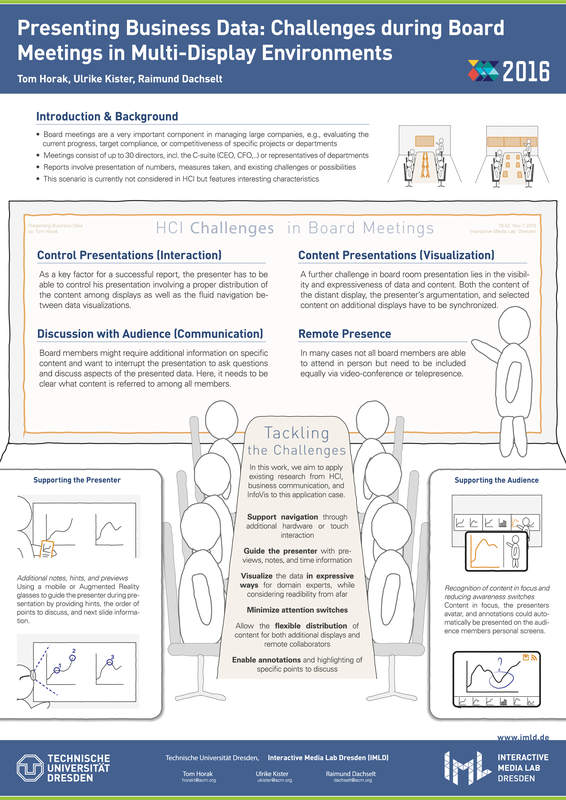 Focusing on selected challenges, we propose first ideas how existing HCI research can help to tackle those challenges and thus help to improve efficiency of board meetings.